This is near my Aunt Carolyn's house in Scarborough - it's a group home and the workers do a fabulous job every year of decorating for their residents. 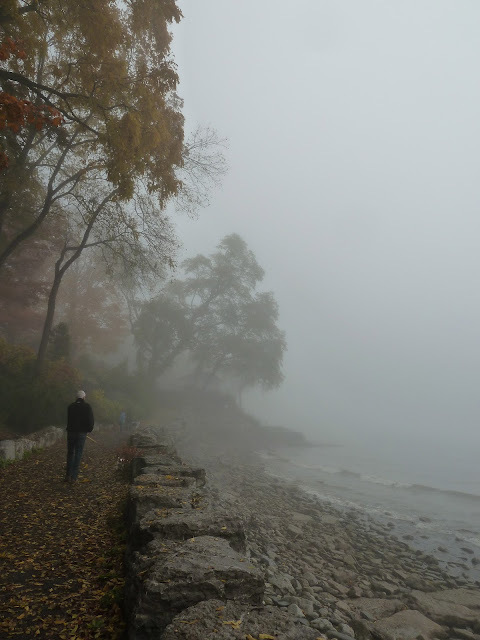 This was the fog before the storm on our morning walk. Fortunately for us Sandy was just heavy rain and high winds. Over the last couple of years, most of unstable old trees have come down, so there were a few branches here and there - nothing major. And, now back to Landscape Ontario Expo. One of the things we learned about at our Garden Writers Association meeting was that Canada is going to host one of the largest floral exhibitions ever, timed to coincide with our Sesquicentennial in 2017. Flora Niagara will be a 69 acre site - right next to Niagara Falls - and two further satellite sites at Vineland and the Royal Botanical Gardens. Bigger in size than Floriade 2012 in Venlo, it is an ambitious event that should draw people from around the world to help us celebrate our 150th birthday. The organizers have said to us - spread the word to our American friends - "Get Your Passports! You're not going to want to miss this." Rodger Tschantz - everyones favourite flower professor at the University of Guelph gave us a presentation on the standouts at the trial gardens - more on this later when I can get his notes and my photos organized. Nothing worse than banging on about a flower and how pretty it is if I can't show you. Down on the floor of the exhibition, looking for trends, it would seem that the decorating world is oozing outdoors like one of those Blob movies. Plastic isn't just for grass these days, it would appear that if you have any space that looks like wood, rock or soil, you can now cover it in woven plastic. Because it is recycled polypropylene it is considered a green product. Not my idea of green, but I guess those yogurt containers have to go somewhere. You can see how the trend in decorating, making your home look like a graphic novel, continues onto the deck. Bring on the fake ficus and rubber-rubber plant. Well, isn't this pretty. I've never seen such a wonderfully illustrated container of fertilizer. Poor photo, but here are the pots to go with the carpets. Blues, some yellows, lots and lots of neutrals, and just one colour per pot. My aunt was looking for a decorative pot for her new living room and wanted something more in a Chinese goldfish style pot. You know, the pretty painted pots that don't look like they've come from the sturdy blue pot factory. Another interesting trend & I was given some to try, is the category of 'bullet-proof grass'. New to our market is a variety called CuttingEdge Grass Seed www.cutttingedgegrass.com. They claim there is virtually no cutting, no watering, no fertilizing. Heck, if this stuff works, and I was in the plastic grass business I'd be really worried. It is a blend of Kentucky Blue and other cultivars, but the roots grow 48". To get the deep roots, you curtail your watering after the 45 day establishing period, which sends those magical roots deep into the ground to look for water. I'll be trying my sample out next year.....stay tuned. So it's goodbye for now to L.O. Expo - really an excellent show - and out to the garden for me for more fall chores. I've put on my glasses this time, so my comment should be more readable than last time. That's a very moody photo of the shoreline. Glad to hear that the storm hasn't done too much damage in your area. The 2017 floral exhibits sound like they would be well worth a trip to see. They do get first place for prettiest fertilizer package, but I'm especially interested in sourcing their incredible fruit tree. That's some fancy grafting. I think that some people have misinterpreted the landscaping concept of garden rooms. They missed the idea of using plants and structure to create spaces in a garden, and went with setting up a complete outdoor furniture suite, including lamps, rugs and knick knacks to mimic the indoors. Or perhaps marketers have just coopted the term to sell lots of stuff. 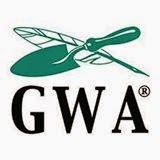 Hi Barbara,I joined the Garden Writers Association this week. I thought I might give it a try, although I think of myself as more of a photographer than a writer. It is about time that someone put some color into outdoor carpets! I love those fertilizers bags. They are rather elegant for fertilizer, but what the heck, eh? Looks like a nice show. Have a great weekend! Jennifer - fantastic! A great group of people, so glad you've joined. Be sure to block of the period in August to go to Quebec City for the conference - and make sure there's loads of room in the car for give-aways. B.
I went back to look at that fertilizer bag - what a giggle. As soon as I find the source , I'll be sure to let you know.